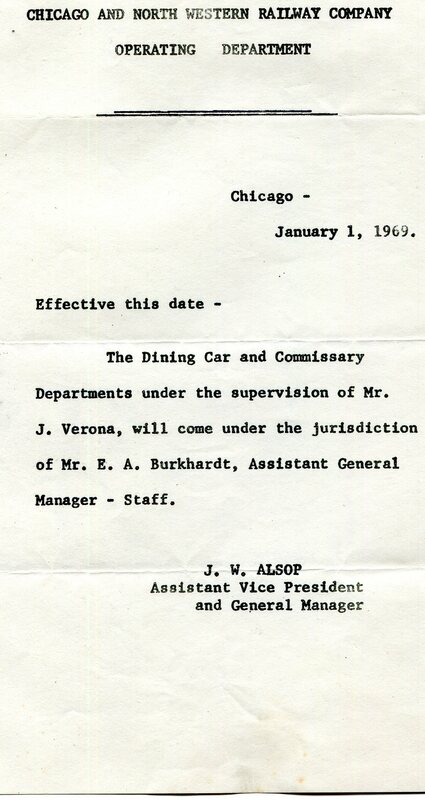 This document of January 1969 places the Dining Car Department under the direct supervision of Mr. Ed Burkhardt. Mr. Burkhardt in Mr. Verona's opinion was a young up and coming executive but book taught, of little experience and "wet behind the ears". He believed that Mr.Burkhardt's appointment spelled the end of the Dining Car Department. While the Department did close later that year, it most likely made good business sense. Mr. Burkhardt was of that new generation of business executives that helped cut the C&NW's red ink and made the C&NW profitable once again. Mr. Burkhardt went on to be one of the finest railroad executives and visionaries. His successes include the formation and expansion of the Wisconsin Central Railroad and many very successful international rail operations.